Bakersfield - 2062 sq. ft. 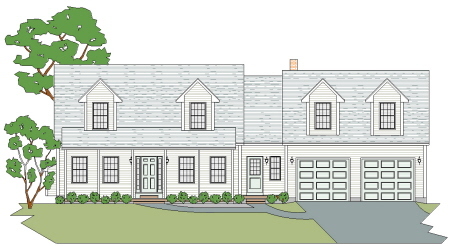 The Architectural style of this 3 bedroom cape cod home plan make it look more like a farmhouse style home than a cape cod home. It would fit in just about anywhere in New England. The floor plan offers an open concept country style kitchen, and the living room has plenty of room for separate seating areas. The easy entry to the cellar on the side of the garage means no messy bulkhead. Upstairs the rooms are all nice sized and the master bedroom offers a lounge area. The 2 car garage has a side entry into the basement eliminating the need for a bulkhead. Bartlett B - 2078 sq. ft. 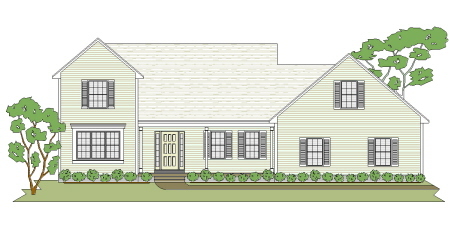 This cape cod home plan, is the same floor plan as the Bartlett A but the footprint is 2 feet longer allowing for about 100 sq feet more. It has the same user-friendly floor plan with comfortable rooms. It features a large country kitchen, a front room with options, and upstairs it has a nice master suite and a double duty bathroom for the kids. As always we can add a porch, dormers. Or a 1,2, or 3 car garage. 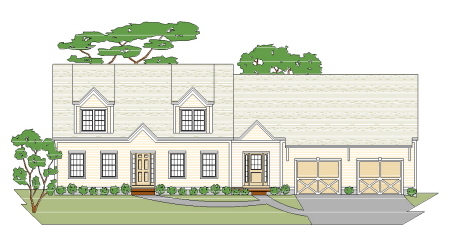 Cape living at its best describes this 30 x 44 3 bedroom cape cod home plan with an attached breezeway and large 3 or 4 car car garage. The first floor amenities include a cathedral ceiling in the large open concept kitchen, dining, and living room and 2 large kids bedrooms. The upstairs is all about Mom and Dad, with a nice master suite with a private bath and plenty of closet space, and a private lounge area for Mom to kick back and relax after a long day. The large garage with storage above (can you say man cave?) is Dad’s dream and has plenty of room for cars, tools, bikes, yard equipment, or just about anything else. 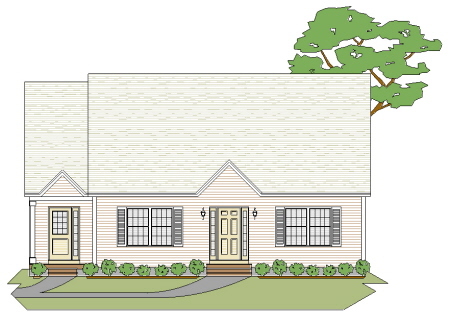 This first floor living 3 bedroom cape cod home plan offers a floor plan that will please the family with teenagers as well as the empty nesters that want some extra room for when the kids or grandkids stop by for a weekend. The open concept first floor with a cathedral ceiling in the living room makes it feel larger that it is. With two large bedrooms and bath up this 3 bedroom home lacks nothing. The 2 car garage offers easy entry into the basement any time of the year. A great plan for anywhere in New England. Amesbury A 2201 sq. 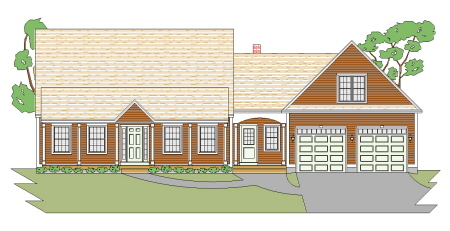 ft.
Maine architectural design coupled with traditional 3 bedroom cape cod styling,curb appeal, and nice large rooms make this home plan a very comfortable home. Add to that a large 2 car garage with a year round inside cellar entry for Dad and what more could you ask for? (OK, maybe a larger garage – we can do that). If you want the upstairs over the garage to be a recreation room, bedrooms or a man cave, give us a call and we’ll finish it off for you. 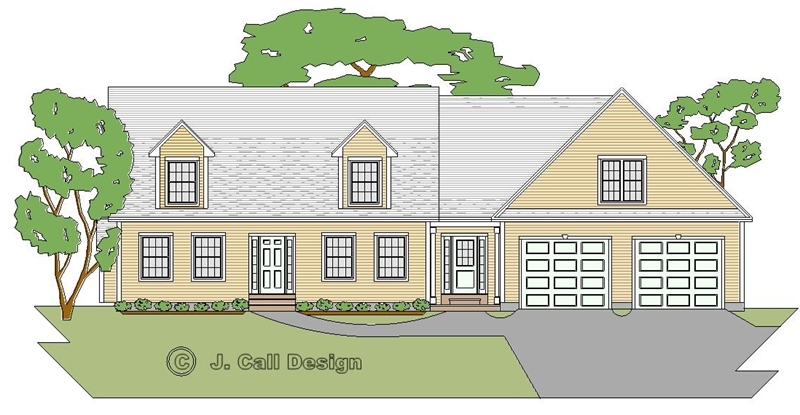 This double dormer first floor living 3 bedroom cape cod home plan is a cut above the rest. It boasts open concept living downstairs and all the upstairs room sizes are very comfortable. 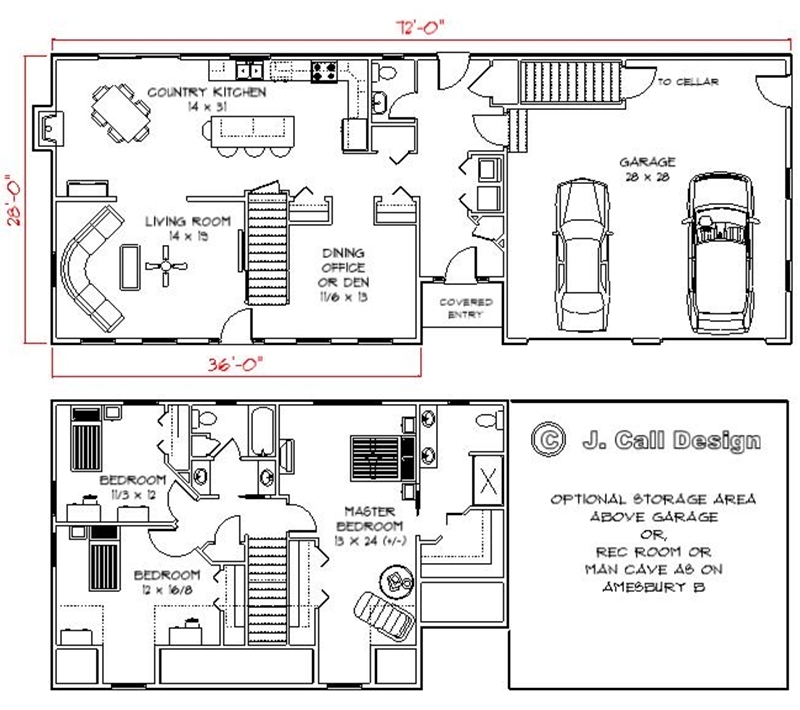 The 2 car garage offers easy cellar entry without the need for a messy bulkhead, and the upstairs over the garage could be used for storage, or rooms with a couple of minor changes. All you have to do is ask and we can change it. Monticello - 2308 sq. ft. 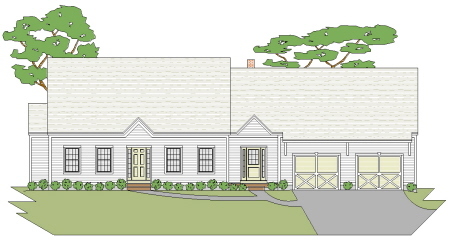 This Modern first floor living 3 bedroom cape cod home plan is a step away from the traditional style. The curb appeal suggests a small home plan, but the floor plan shows that it is truly comfortable and not small at all. It has large rooms and amenities to numerous to mention here, you only have to decide if this great plan is for you. If you’re looking for large open concept first floor living, look no further. 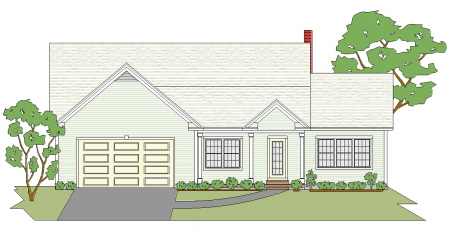 This dormered 3 bedroom cape cod style home plan with a porch, breezeway and 2 car garage is it. The first floor offers an open kitchen, dining and living room and a large master suite. The second floor offers two large bedrooms and a lounge/study/reading area. The garage is large enough for the cars as well as bikes and garden equipment. Bartlett C 2404 sq. ft. 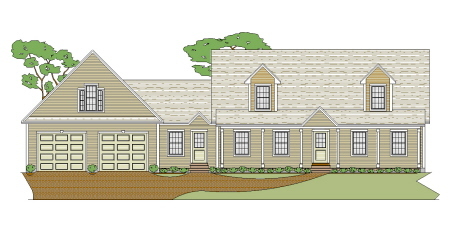 This 3 bedroom cape cod home plan offers all the same amenities as the Bartlett A and B with even more room. The downstairs offers a large country kitchen, large living room and a front room with options. The upstairs offers a great master suite with a nice master bath and the kid’s rooms share a double duty bathroom. The large 2 car garage garage offers easy entry to the cellar all year long. Northfield - 2540 sq. ft. 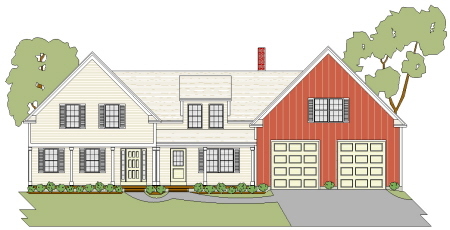 This farmhouse style, high posted 3 bedroom cape cod style home plan even has an attached barn. Kinda looks a bit like grandma’s house in the country doesn\'t it?. A large country kitchen, dining and living room and a very large “car guy” garage make up the first floor. The second floor has two large kids rooms and a double duty bath while the master suite has room for a lounge area to relax in after jumping out of the whirlpool in the master bath. Not to mention a closet for the lady of the house to get lost in. You can order an option for the space over the extra large 4 car garage and have either storage, a recreation room or man cave. Bradford - 2575 sq. ft. This 3 bedroom cape cod home plan looks like a traditional dormered cape with a porch on the outside but the cathedral ceiling in the living room is a nice modern surprise. Add to that a country kitchen, a front room that can be a bedroom or den, and a living room with a fireplace and you have the makings of a great first floor plan. Upstairs are two large bedrooms, a bath and a recreation room or man cave. The 2 car garage has a entry to the cellar eliminating the need for a bulkhead.